The guy linked to Antifa who accosted the 9/11 widow on the streets of Portland was identified as Steve Wilson, aka SalvadOrwell Wilson on Facebook. MilneNews is in direct communication with the 9/11 widow who contacted us via Facebook after seeing the video on our Facebook page. She does not want her name published out of fear but was able to help us identify her abuser. Journalist Shane Kavanaugh from The Oregonian upon seeing the viral video of the 9/11 victim being abused set out to find the woman and he did. The 9/11 widow confirmed to us that Shane Kavanaugh left numerous messages on Facebook and even managed to get a hold of her private phone number. She doesn’t know how this is possible as she said she has her number privately listed. She did not reply or return his calls as she said she didn’t trust him. The Oregonian/OregonLive has been able to identify the woman, but not the man. He’s wearing a black hoodie emblazoned with the logo for AK Press, a book publisher that specializes in anarchist and radical literature. The woman didn’t respond to multiple phone calls and Facebook messages Thursday seeking comment. New York police and others associated with 9/11 can’t confirm she was married to a 9/11 victim. Zeroing in on the woman’s NYPD ballcap, some of the most shared posts and tweets of the video declare that her husband was a New York police officer, of which there were 23 killed in the attack. That’s unlikely, officials with several New York City police unions said. Mladinich, a retired NYPD detective, conceded that it remained possible that the woman’s husband was a Port Authority police officer, a firefighter, or one of the nearly 2,000 other men believed killed in the attack. Her prolific posts on Facebook also make no mention of a husband killed on 9/11, even on this year’s anniversary. On that day, the woman posted a news story about antifa, shared a video that lambasted universal health care and included a commemorative message from President Donald Trump. 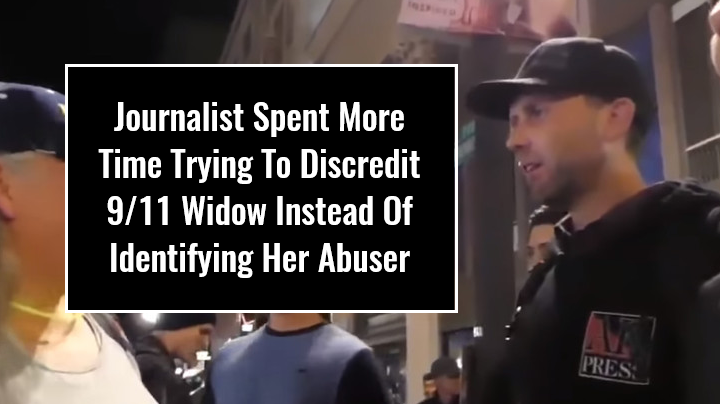 Shane Kavanaugh went out of his way to find the 9/11 widow and discredit her while spending little to no time trying to identify the man who accosted her. So why didn’t he look for people in Portland that are associated or “like” this small publication? He presumes the woman’s husband as a NYPD police officer based on that she was wearing an NYPD cap and pointed to it. When we asked the 9/11 widow if she was referencing that her husband was one of the 22 officers that died that day, she confirmed to us that she was merely pointing to cap as she said 9/11. She never said once that her husband was one of the 22 officers that died that day. Only that he had died in the 9/11 terror attacks. She said “My husband died on 9/11,” she never said she was the widow of one of the 22 NYPD police officers that died that day. So when he tried to match certain ‘public records,’ he was doing so matching them up to the 22 officers only. When we asked the woman if Mladnich’s statement is more on the mark regarding her husband, she said yes. Furthermore, now that we have identified the man as Steve Wilson. Shane Kavanaugh have not updated their article to include this information. Journalist Shane Kavanaugh and The Oregonian were more than happy to seek out the 9/11 widow, try and discredit her while ignoring facts to do so. That’s how it’s done Shane Kavanaugh. Previous Previous post: Migrant Admits Criminals Are Traveling With The Caravan Headed To The U.S.